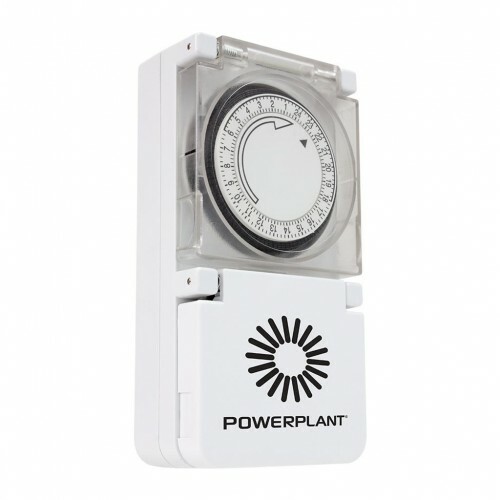 The Powerplant Heavy Duty Timer is the only timer that you will need. It is specially designed to carry high loads. As it will comfortably manage the inductive load from a 600w ballast,you will be saving money by not having to invest in a separate contactor and relay. It is important that these timers, and not normal household timers, are used with HID ballasts. Household timers are not designed to carry the heavy current load, and you will run the risk of the internal mechanism overheating and failing, with the accompanying risk of the lights staying on all the time, but there is also a serious risk of fire as the parts overheat. This timer has a sturdy case,and the timer is equipped with a cover designed to keep dust and moisture out. The timer plugs into an ordinary socket. The timer can alter it state every 15 minutes giving you 96 switching operations ever 24 hours,so it is possible to set up an infinite array of lighting scenarios to suit any growing situation. Lumii Black 600w Sunmaster Lamp Grow Light KitThe lumii 600w sunmaster light is a great value for mo..
Lumii Black 600w Dimmable Sunmaster Grow Light Kit "NO NEED TO CHANGE THE 600w BULB ON ANY SETT..
5" Lumii Black 600w Cool Tube Light KitA Great value for money grow light kit with a 2 year warranty..
Lumii Black 600w Adjust-a-wing Enforcer Light Kit The Lumii Black 600 watt Adjust-A-Wings Grow ..